All wedding packages include a meeting with the photographers at the venue or your home in advance to discuss the Bride & Grooms requirements, and to take a number of pre wedding photographs. We feel this is an essential part of our service which gives that extra personal touch. 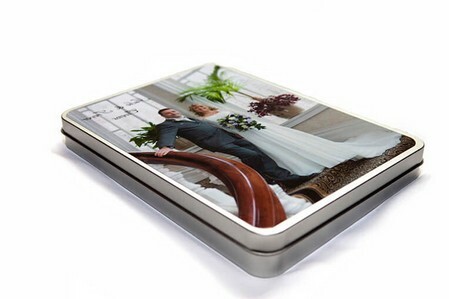 Each package includes a personalised presentation Tin holding your chosen photographs, as displayed on the right. You will also receive either a printed DVD & case with all of your photographs shown in full resolution or a USB stick. These include a copyright release form to allow all of your pictures to be printed as many times as you want. Each photograph will be professionally edited to ensure they are of the highest quality, with extra selected copies made into black and white. To allow you, your friends and family to select your photographs to print we also provide you with a customer login on our website, where you can view all of the photographs taken & download an order form if extra prints or a canvas is required. Covering the wedding from before bride’s arrival, through the service, posed photos after and extra reportage style photos throughout (approximately 2 hours in total and 200+ photos taken). Includes 25 7x5” Prints & all photographs taken at full resolution on your choice of DVD or USB memory stick - £550. £10 per extra DVD or USB memory stick. Canvases are also available. Covering the wedding from bride’s accommodation, arrival, through service, posed photos after and extra reportage style photos throughout (approximately 3 hours in total and 300+ photos taken). Includes 35 7x5” Prints & all photographs taken at full resolution on your choice of DVD or USB memory stick - £700. Covering the wedding from bride’s accommodation, arrival, through service, posed photos after, reception, posed cutting of cake, extra reportage style photos throughout (approximately 5 hours in total and 400+ photos taken). Includes 40 7x5” Prints & all photographs taken at full resolution on your choice of DVD or USB memory stick - £800. Covering the full wedding from bride’s accommodation, arrival, through service, posed photos after, reception, cutting of cake, first dance and extra reportage style photos throughout (approximately 7 hours in total and 500+ photos taken). Includes 45 7x5” Prints & all photographs taken at full resolution on your choice of DVD or USB memory stick - £900.